#4 buck, not to be confused with #4 shot, is one of the most popular home-defense buckshot sizes on the market today for 12 gauge shotgun owners. The reason? It’s devastating at close range, but doesn’t penetrate nearly as much as 000 or 00 buck. #4 buck will definitely kill a large deer, so humans wearing normal clothing won’t stand much of a chance at close range. At longer ranges, #4 buck may not be ideal for bringing down or neutralizing a threatening human or other large animal. What makes #4 buck so popular for home defense? Penetration versus power is the scale of balance in home defense. Too much penetration, and you’re going to go through your target and damage property or the people behind it. Too little power, and you’re less likely to stop someone if they are set on reaching you. There are many different buckshot sizes and uses, so it's good to know that #4 buckshot caliber offers a good balance between number of pellets, pellet size, penetration and stopping power. With a pellet count commonly between 21 and 24 of .24-inch lead balls traveling at about 1,200 feet per second, a serious impression will be made on your target. When comparing 4 buckshot vs. 00 buckshot, #4 is somewhat less powerful than 00 buck, which is used by most law enforcement agencies in their shotguns. However, they are more likely to engage their targets at longer range than the average homeowner. 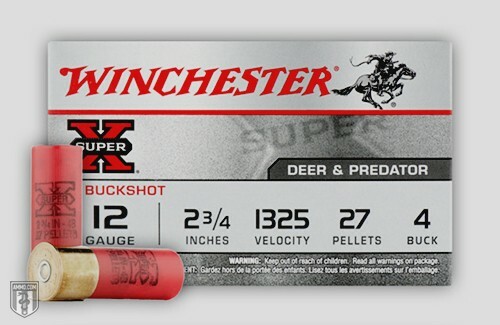 Number 4 buckshot is most commonly used for deer, coyote and other similar sized game and predators. The whole idea of hunting game with shot is debatable to some, and a given to others. Because while there are hunters who feel that shotguns using buckshot is a poor choice for hunting (as it is less likely to produce a quick kill), there are others who claim that buckshot is more likely to make clean kills versus a rifle shot. It all comes down to what you like best, as opinions vary widely. Some people prefer fewer large pellets that can cause massive damage and have supreme penetration, while others prefer a vast amount of smaller pellets that inflict more damage to more surface area with less penetration. For the hunter as well as the home defender, 12 gauge #4 buckshot is a great choice to eliminate predators (whether it's the two or four legged kind). And it's easy to find, available from manufacturers like Remington, Hornady, and Sellier & Bellot.